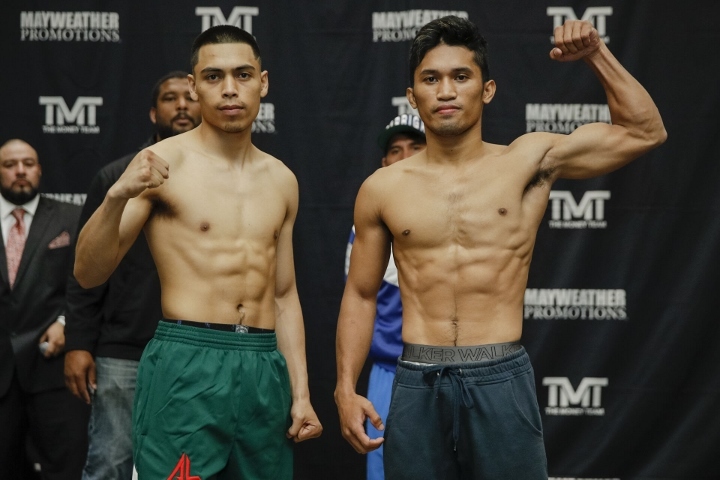 Fast rising super bantamweight prospect Angelo Leo (16-0) will fight for the second time this year when he faces Neil John Tabanao (17-4) at Sam’s Town Hotel and Gambling Hall in Las Vegas, Nevada. Leo plans on having a busy 2019. The Mayweather Promotions’ fighter has fought at the venue several times but this is easily the biggest fight of his young career. Leo will be headlining a ShoBox triple header in what will be his first fight scheduled for 10 rounds. “Training is going great. This is going to be my first 10 rounder. I have been working extremely hard for this fight and I have been increasing my running and the rounds of sparring. I feel in good shape and I am ready to go the whole 10 rounds if I have to,” said Angelo. Tabanao, who fights out of the Philippines, has won 4 fights in a row after losing his previous 3. Leo has studied some of his previous fights and has a lot of respect for opponent. “I have seen a few fights of his. He is a good fighter and a counter puncher. He likes to counter off the high guard. He has fought Isaac Dogboe who is a former world champ and he went the distance with him so he is no push over. He does have some pop in his punch so I will have to worry about that. Other than that I think I have an advantage on the footwork, the feints and in speed,” Leo explained. Dogboe, who is a former world champion, is by far the best opponent that Tabanao has faced. Some fighters compare what other fighters do against common opponents as a measuring stick. While Leo would like to outperform Dogboe, he said that he isn’t putting any extra pressure on himself. “In a way it does (add pressure) but at the same time I am not going to look for a knockout. If the knockout presents itself then I am going to take it,” Dogboe stated. Leo believes that a win on a platform like ShoBox will be the springboard to launch his career. He is hopefully that a few more big wins will propel him to a title shot. “With a win I would be 17-0 and then talks of a world title will be in the air. Let’s see what my promoter says but talks of a world title would be in the near future,” Leo told BoxingScene.com before breaking down the rest of his weight class.